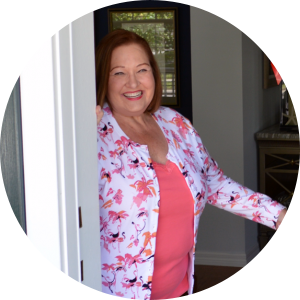 I do a lot of Facebook Live videos and I like to ask my viewers what they would like to see. 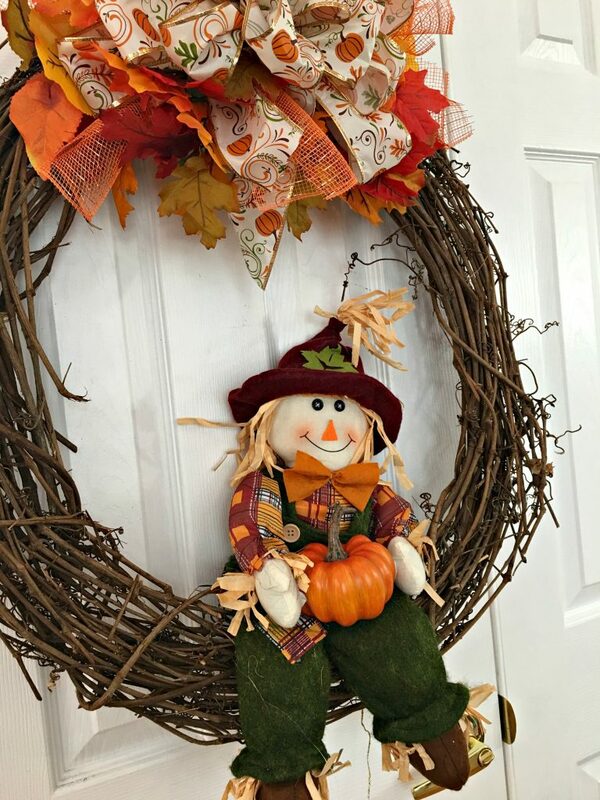 This fall wreath with a scarecrow was a request from a viewer like you! 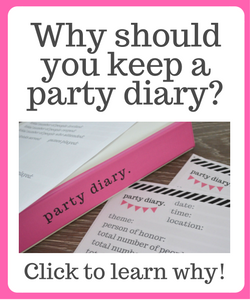 If there is something you would like to see, let me know! I spotted this cute little fellow at Michael’s on sale! 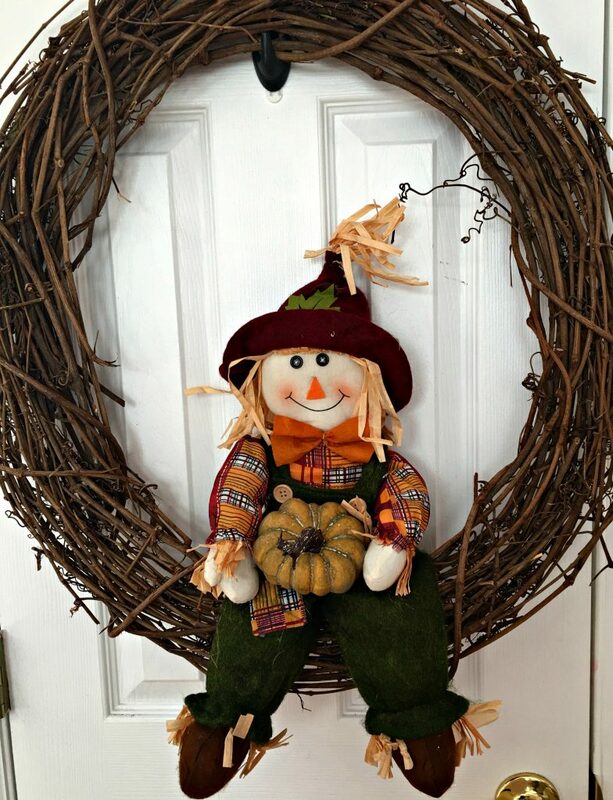 He just seemed like the perfect to sit on my fall wreath and hold a little pumpkin. 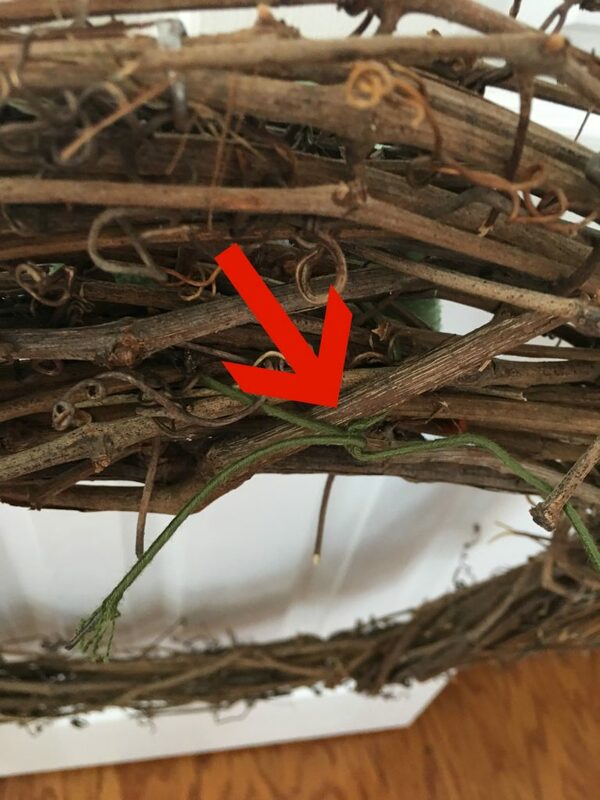 I began with a 24″ grapevine wreath. 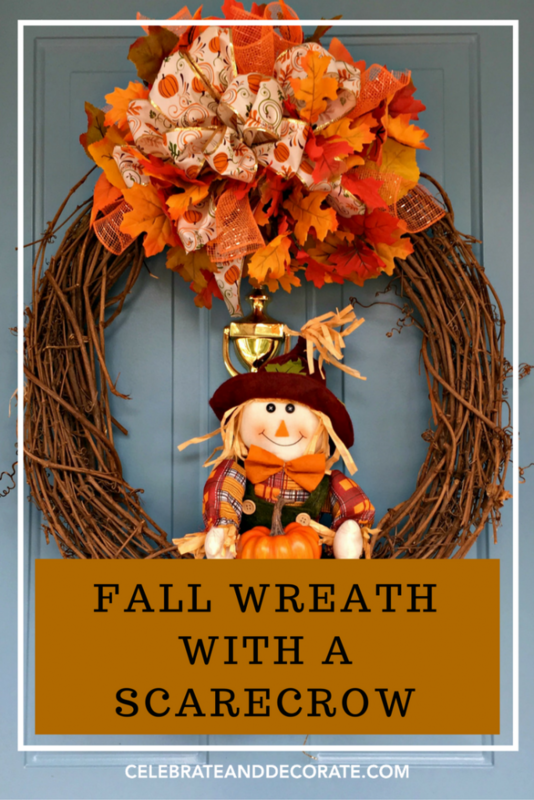 grapevines are great for fall wreaths, suggestive of the harvest. Doesn’t he look cute sitting on the wreath? I decided I needed a brighter orange pumpkin than this one, though. 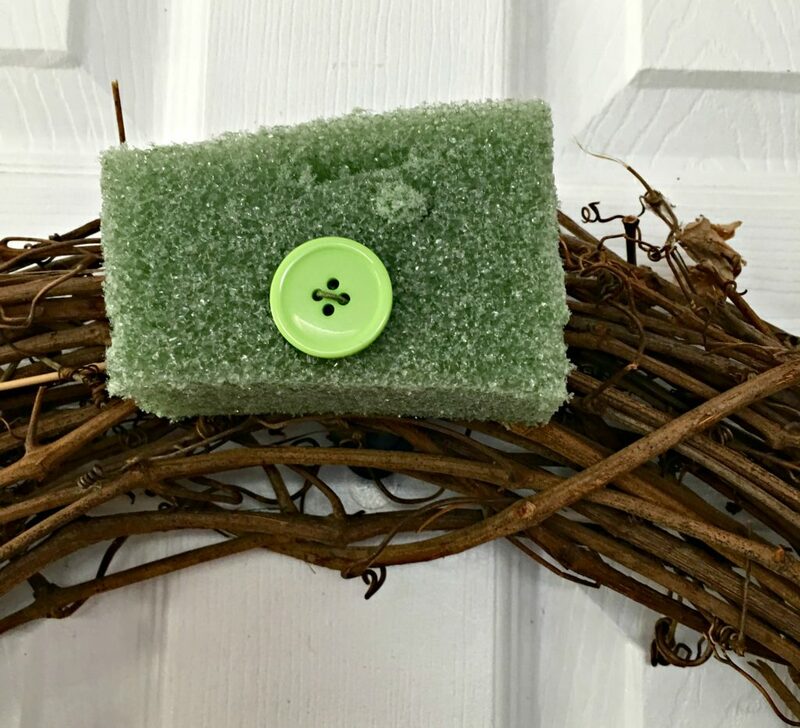 I am always showing you this complex way to attach styrofoam to a wreath or for a swag, until a couple of readers suggested I use a button. Select a button that is about 3/4″ across. 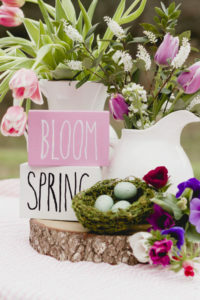 You don’t want too big of a button or you will keep running into it when you are trying to make your arrangement in the styrofoam. Too small and the button could possibly pull through foam. 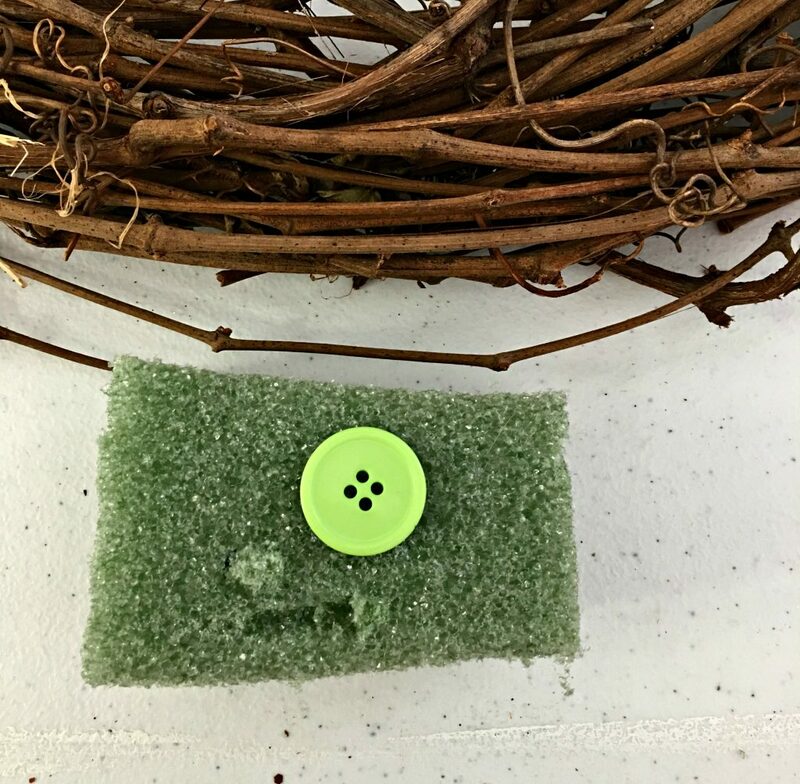 I used a piece of paper wrapped wire, pushed two of the ends through the button and through the styrofoam. 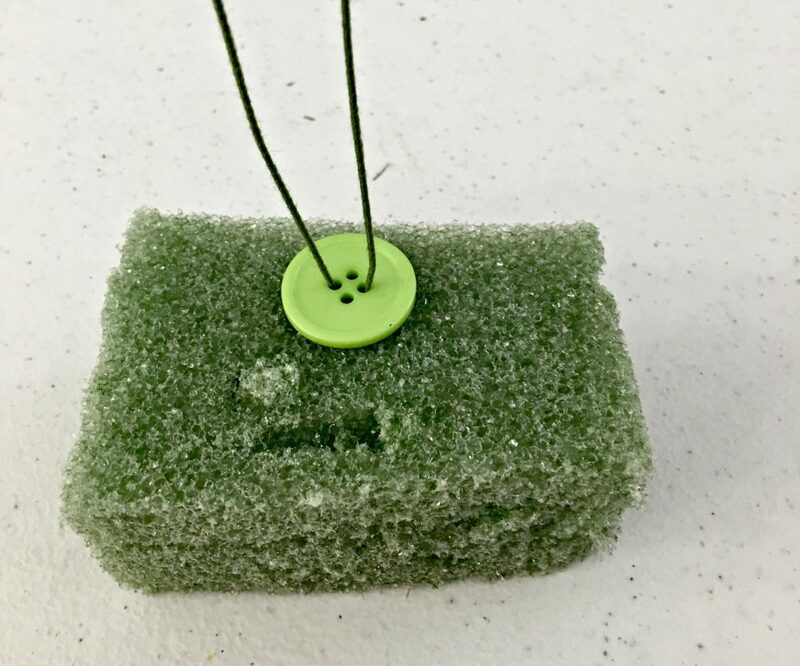 This button will keep the wire from pulling through the styrofoam. Push the wires through the grapevine at least four or five inches apart. Pull the wires through the back and twist them tightly. 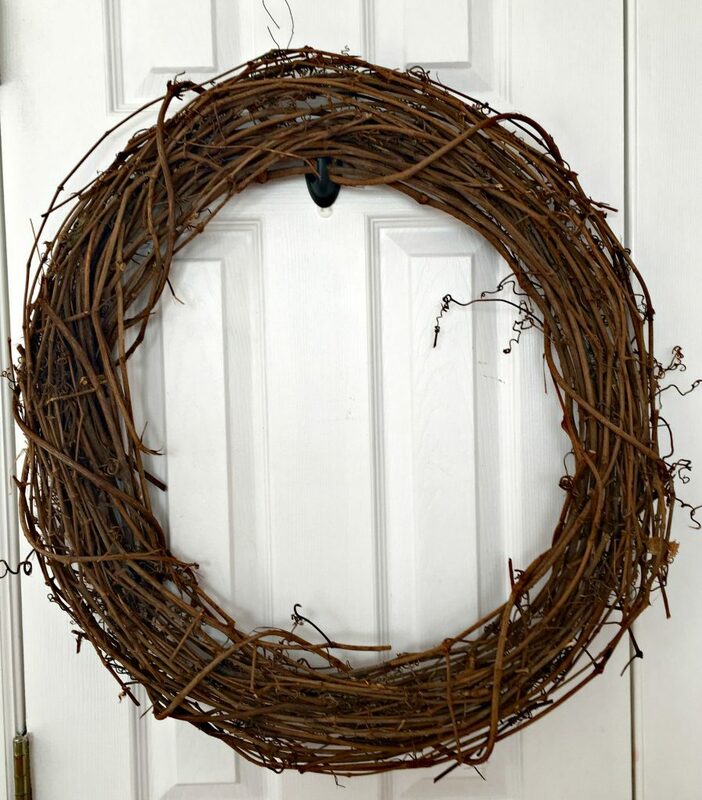 You can make the remainder of the wire into a circle to hang your wreath from. This is how the foam will look from the front. 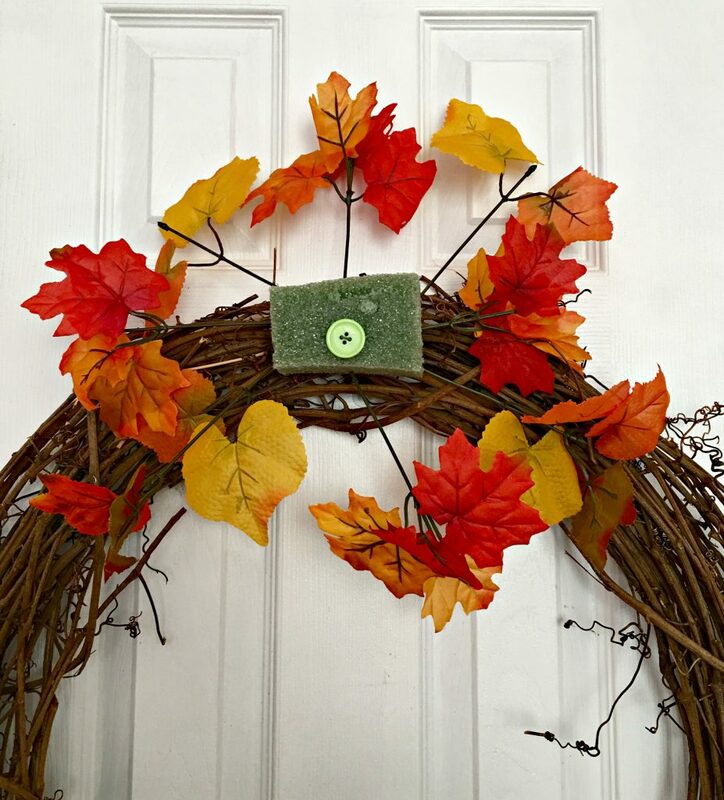 Ready to add decor to your wreath. I began by simply adding pieces of fall leaves. 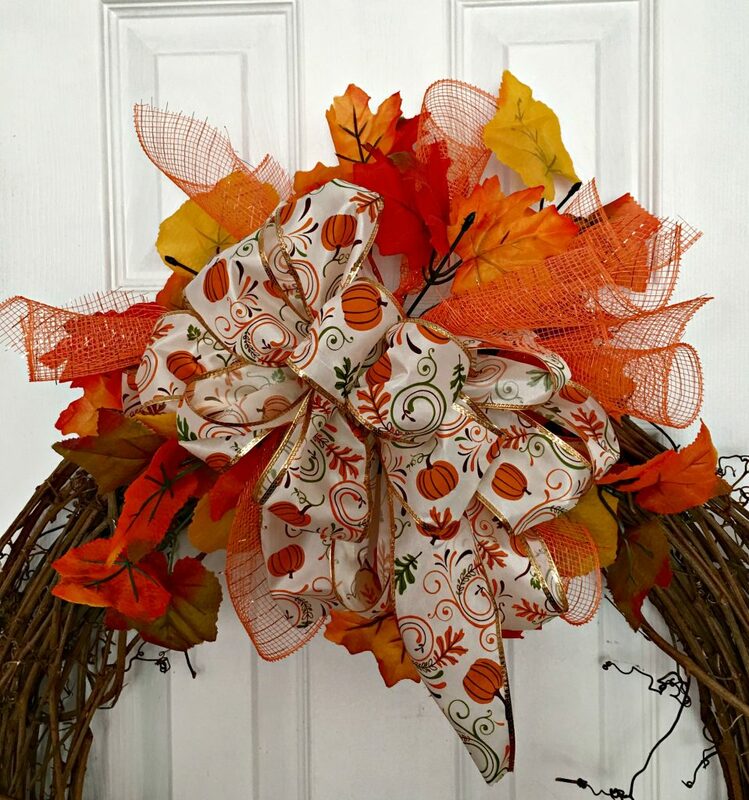 I used all fall leaf stems from the Dollar Tree and cut them apart to use on this wreath. 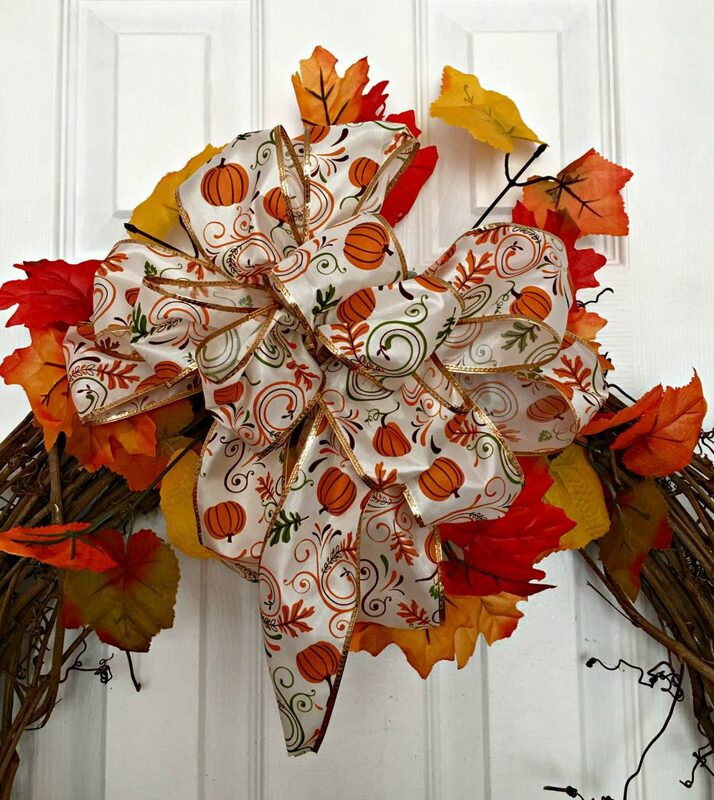 I found this fall pumpkin ribbon also at Dollar Tree. I bought two of these, each was nine feet long. I used all of those nine feet to make this bow. That gives you an idea of how much ribbon it takes to make a bow; always more than you think! 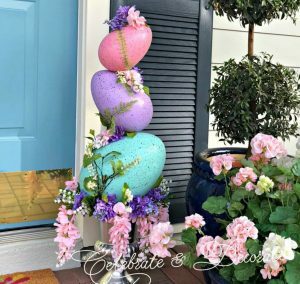 Put that bow in the middle of your foam and then start filling in all around the bow with additional leaves and deco mesh rolls. 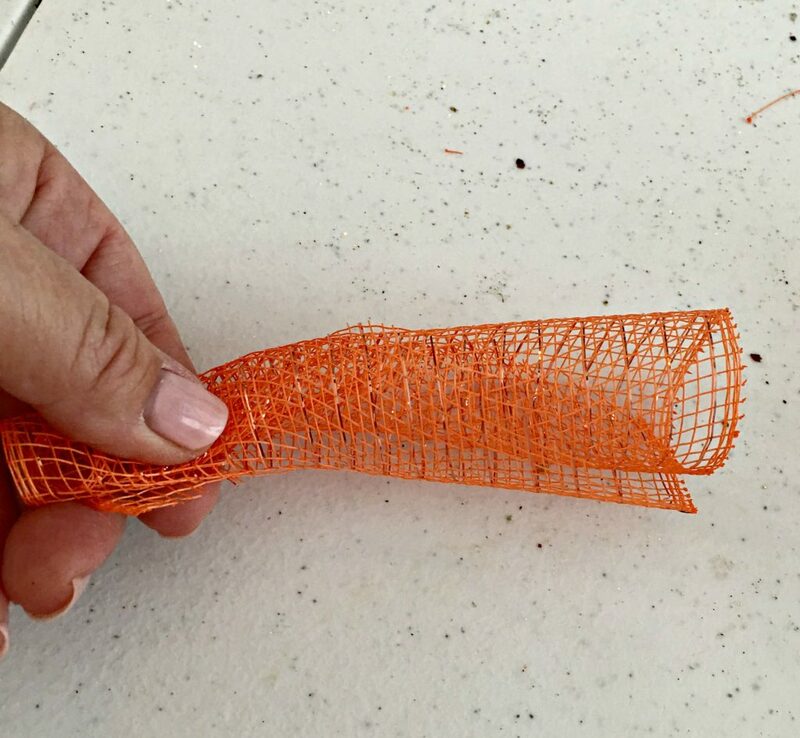 In addition to the leaves, I decided to venture into the world of deco mesh and used this 5 inch orange deco mesh cut into 6 inch pieces and rolled them as shown above. 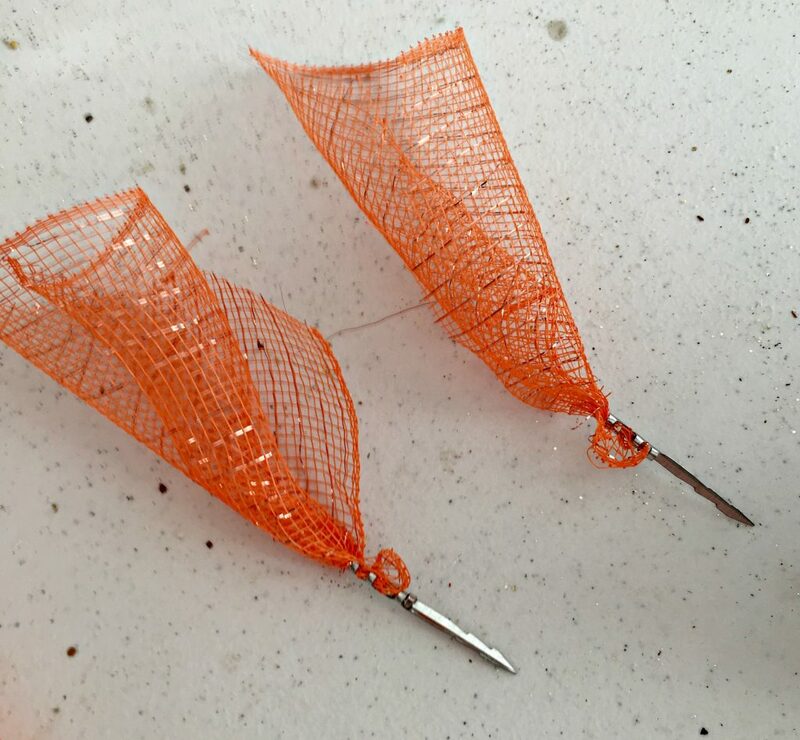 I took each of my pieces of rolled mesh and secured them with a steel pick from my steel pick machine. You can also use wood wired sticks to secure them. Build up that arrangement all in and around the bow. 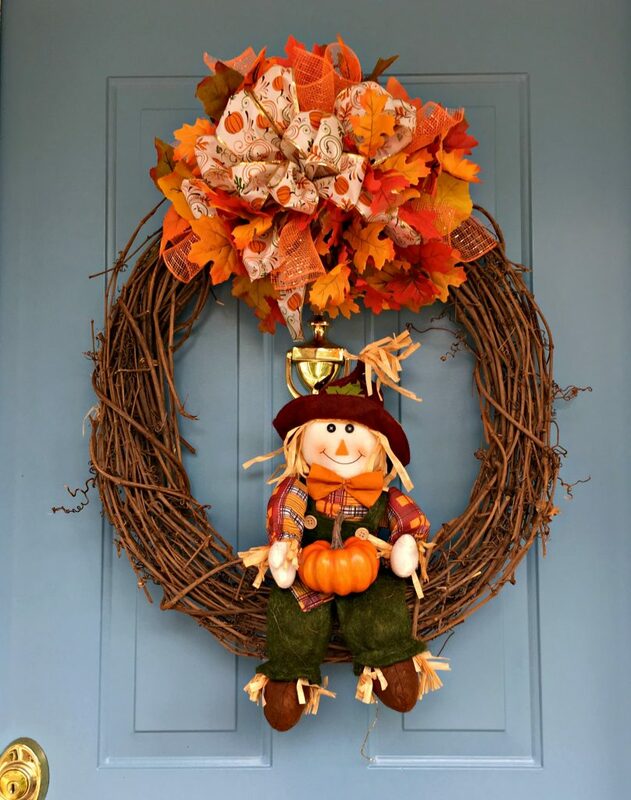 Time to finish adding flowers and deco mesh to the arrangement at the top of the wreath and give my little scarecrow a spot to sit! 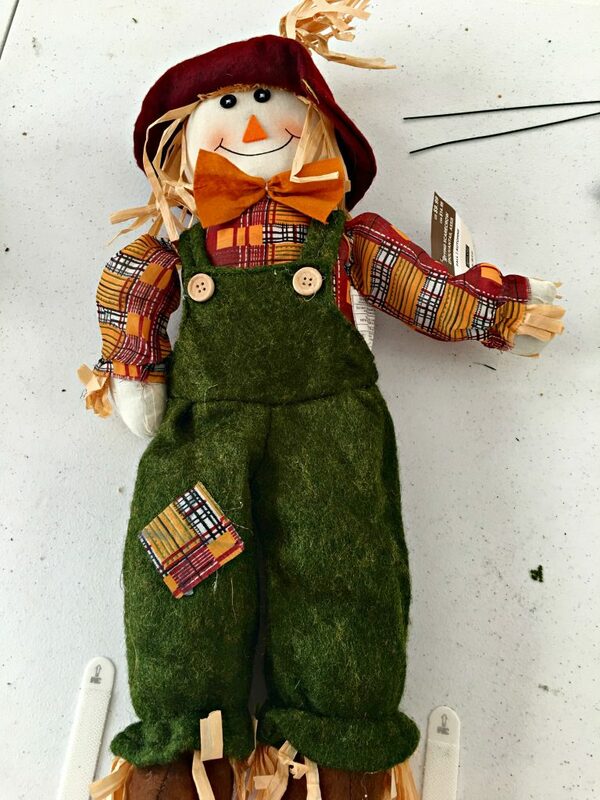 I used wire to secure my scarecrow and then used a little hot glue to his hands to secure them to the brighter orange pumpkin I found for him in a little faux pumpkin patch! 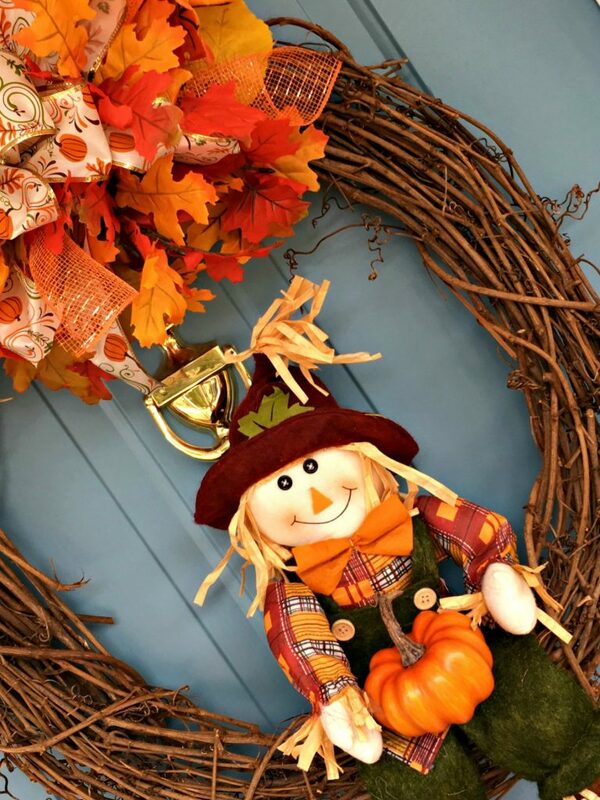 How cute is this little fellow all smiling and ready to greet guests at your front door this fall? What does he have for you? A little orange pumpkin from the pumpkin patch! Very cute! I like your simple solutions.